It’s a good Monday morning and I’m excited to be back on the blog after another short break. Today I’m bringing you some stunning layouts using You Color My World Collection. Save 30-50% now through February 8th! With Valentine’s Day approaching, this Collection would perfectly showcase the ones you love. 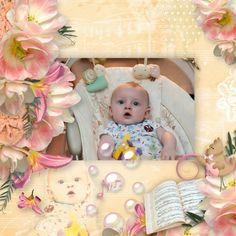 The soft pastel palette would work great for babies and the whimsical hand-drawn doodles would be a great addition to a layout featuring your furry friends. 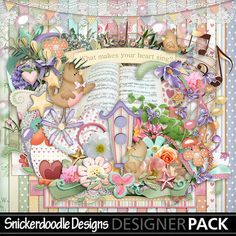 I know you are familiar with the fact that SnickerdoodleDesigns’ Collections are packed and always very versatile as I will demonstrate now. I didn’t mention it previously but, of course, this Collection is perfect for creating art-themed projects. I like the paper stacking in this layout by Kythe. The green and yellow solids work well to frame the page. I like the inked edges and barely visible words on the white paper, included in the Collection, she chose. Masking the photo really makes the subject the focal point. Overlaying the word art makes it seem as if it’s part of the mask. I like the happy photo Deanna used on her page. Tilting it just slightly adds interest to the page. The heart borders work to draw the eye into the layout. I like the small sweet cluster she added to the corner of the photo. Combining one of the kit doodles with the word art creates a special element unique to this artist’s page. 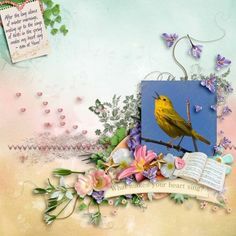 Sometimes less is more and that’s definitely true in this page by Glori2. The doodled background paper is actually included in the Collection. I love that it comes complete with stripes and dots and wonky lines. Adding the doodled swirl and dot pattern complements the paper perfectly. I like the way she placed a single flower at the end of the swirl as if it were a stem. The bow tied leaves balance the v-shaped pattern of heart doodles and the arrow from the kit moves the eye to the sweet photo. Whether you make the art or you are the art, this is the perfect Collection for you as shown in this layout by Kay. The rainbow background is lovely and the double-framed, masked photo is very creative. I like the way she stacked the charms and added her clusters both behind and in front of the photo. Placing the bubble scatter on top completes the layout flawlessly. I really like the simplicity of this layout by Linda. The large, masked photo jumps out next to the pastel paper. Adding the smear in the upper corner as well as the dot doodle behind the cluster works well with the blended paper. The black doodle perfectly complements the black-outlined leaves as does the black title. I love the font she chose. 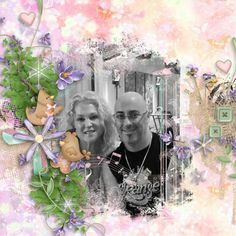 I’ll finish off my post with this charming layout by Norma. I really like the way her photo looks more like a sketch and the softness of it works so well with the soft colors in the Collection. She was able to incorporate so many of the elements in the Collection without crowding her page. Although she began with one of the blended papers in the kit she added the paint accent to it to achieve a different look. Her clusters are so small and dainty and the glitter scribble is perfectly placed. I like the stitching on two sides of the page. I’ve come to the end of my post and I hope I have inspired you to make some colorful and creative art of your own. Did you see the matching cluster posted on the blog a few days ago? I’ll add it again here in case you missed it. Thanks and have a great week! The collection is just lovely and the layouts are amazing! So many talented “followers” you have, Karen!! I hope to be one of them sometime soon! I appreciate your comments on each layout because it always appears to me as one great put-together page. Having you point out things in detail helps me to develop my own eye to see what it takes to make it all come together! Thanks for your feedback, Barbara! I’m glad to know the inspirational comments are helpful!